Light micrograph showing two neutrophils (centre) surrounded by red blood cells. Neutrophils are a type of white blood cell (leucocyte) and belong to the group known as granulocytes. They are produced in the bone marrow and take between six to ten days to reach their mature stage. They are very mobile and engulf and destroy cell debris and microorganisms by phagocytosis. 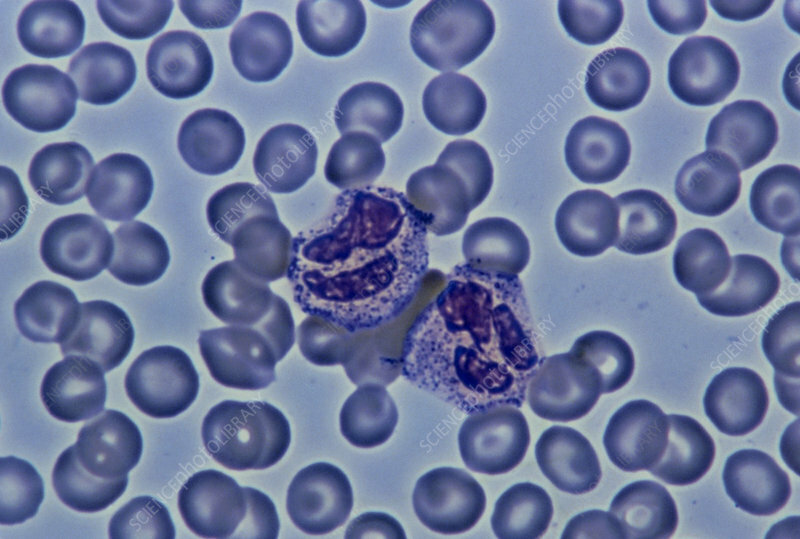 The nuclei (dark purple) of the neutrophils are here clearly visible. At the mature stage the nucleus divides into five lobes. The cytoplasm is characterised by tiny dark granules which contain lysozyme and enzymes partly responsible for bacterial destruction. Magnification: x400 at 35mm size.